Obtain an official application for name change from the clerk of court in the county in which you live. Many states enforce both residency and age requirements on anyone seeking a legal change of spelling or name. In the state of Minnesota, for example, you must be 18 years of age and a resident of the state for at least six months. In all states, a parent or legal guardian must file the application on behalf of a minor. Fill out the form, which will ask for the correct and complete spelling of your current legal name and the new spelling for which you are applying. 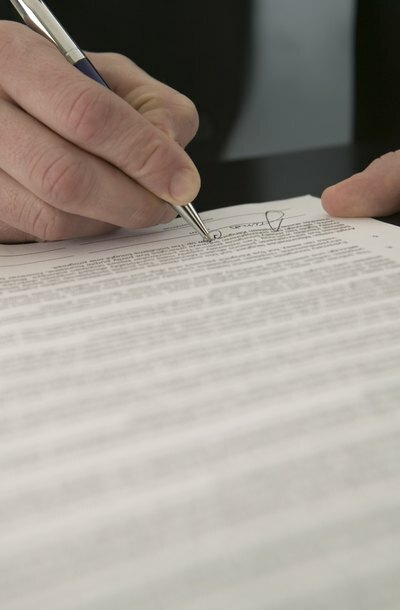 Sign your current name and take any required oath before a notary public. If this will also change the spelling of your spouse's or children's names, they must also sign. You may also have to submit to a background and criminal check. Many states require that anyone with a criminal conviction attempting to change his name must report the change to the prosecuting authority, which can object to the change. Fill out a proposed Order that a judge or authorized clerk will sign to make your new spelling legal. Do not mark or fill in any information in spaces designated for the clerk or judge to complete and sign. Bring the form to the clerk of court and pay the filing fee. There may also be copying and certifying fees to pay. You may be able to file the application "in forma pauperis," meaning you are destitute and request that the court waive the fee. The clerk will date-stamp and file the application and enter it into the public record. The court will schedule a hearing that you must attend along with anyone else -- a spouse or children, for example -- affected by the spelling change. Attend the scheduled hearing, at which you will appear before a judge or hearing officer. Take an oath as to your identity, explain the reason for the new spelling of your name and answer any questions from the bench. The judge or hearing officer will then sign the proposed Order and enter it into the record. You may obtain certified copies of the Order from the clerk. Although changing your name is a personal choice, when you can make that change depends on your age. Adults can change their names at any time; minors must wait until they reach adulthood to do so, unless they are legally emancipated or have parental consent. Regardless of age, certain restrictions apply; for example, those with criminal records often don't qualify. A hearing takes place where a judge either approves or denies the request for a name change.